To some, this can seem like an old and outdated celebration in the Church. It can be seen as one of those ancient feasts that have little meaning in our lives today. Nothing could be further from the truth! The Sacred Heart of Jesus is exactly what we need to know, experience and receive in our lives today. His heart, that heart which was pierced by the lance and from which flowed blood and water, is the sign, symbol and source of the burning love of His very soul. The blood is an image of the Most Holy Eucharist and the water is an image of the cleansing waters of Baptism. This celebration of the Sacred Heart of Jesus is a celebration of Jesus pouring out on us His whole life and all of His love. He held nothing back which is symbolized by the pouring forth of the last drop of this blood and water from His Heart as He lay there dead on the Cross. Though it’s a very graphic image, it’s graphic to make a point. The point, again, is that He held nothing back. We need to realize that Jesus continues to give us everything if we are willing to receive it. If you are finding that you need to know His love more deeply in your life this day, try spending time reflecting on the Scripture passage above. Spend time reflecting upon that last self gift, the gift of that water and blood flowing from His wounded Heart. It is a sign of His infinite love for you. Reflect upon it being poured out especially for you. See it, be immersed in it, and be open to it. Let His love transform and fill you. 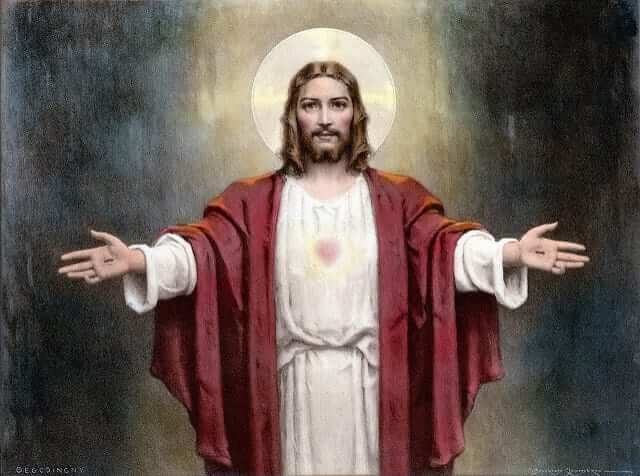 Sacred Heart of Jesus, have mercy on us. I thank You, dear Lord, for giving all to me. You held nothing back from me and You continue to pour out Your life for my good and for the good of the whole world. May I receive all You give to me and hold nothing back from You. Jesus, I trust in You.